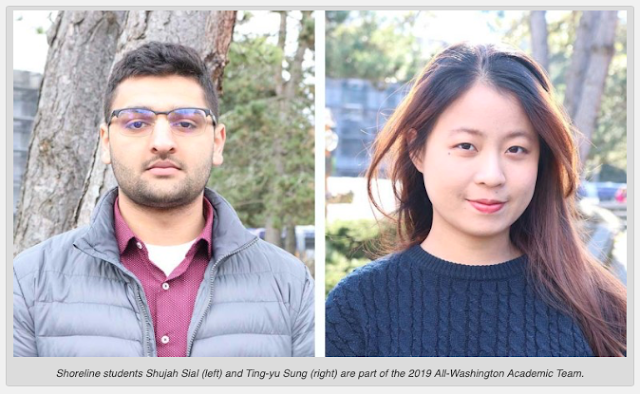 Two Shoreline Community College students, Ting-yu Sung and Shujah Sial, will be honored with about 70 of their peers from across the state at the All-Washington Academic Team recognition ceremony in Olympia on March 21. Sung and Sial, both in their second years at Shoreline, were nominated by their professors for academic excellence and positive contributions to the community. The All-Washington Academic Team program “recognizes and honors our state’s finest higher education students… the men and women who have demonstrated a commitment to success in the classroom and in the communities in which they live,” states the event webpage. Honorees all attend one of the state’s public community or technical colleges. Sung, a first-generation college student from Taiwan, is studying mathematics and statistics at Shoreline and plans to transfer to the University of Washington. She hopes to work as a data scientist for Doctors without Borders to combine her passion for helping people with her aptitude for numbers. Sung works on-campus as an International Peer Mentor, helping new students navigate the college, and has done volunteer work for YWCA, the Leukemia and Lymphoma Society, and the Ronald McDonald House. Sial, also a first-generation college student, is studying economics and plans to transfer from Shoreline to the University of Washington. From there he hopes to work for the State Department as a Foreign Service Officer and combine his passion for international affairs with positively impacting lives. Sial started and leads Shoreline’s Model United Nations Club and serves as secretary of the Honors Student Council and president of the Pi Iota Chapter of Phi Theta Kappa. He flew to Houston to volunteer after Hurricane Harvey and has volunteered with the Skagit Valley/Humanity First Food Bank. The recognition ceremony takes place Thursday, March 21, 2019 at South Puget Sound Community College in Olympia. Members of the 2019 All-Washington Academic Team will be honored by Governor Jay Inslee and their college presidents. Learn about The Honors College at Shoreline.